"Sampath Speaking" - the thoughts of an Insurer from Thiruvallikkeni: interesting IPL ~ team compositions, tosses, probabilities and fumbles !! interesting IPL ~ team compositions, tosses, probabilities and fumbles !! Watching a Test match at Chepauk was charming in every manner ~ in those days of no or little TV coverage (remember that in 1970s – there would be only one camera – one angle – bowler running away and in the next coming towards you) – the whole stadium would erupt – then one could sight the two white-coated gentleman starting their walk to the middle ~ thousands would wait with bated breathe as the coin would be tossed .. .. and theories would galore on who has won – and what would be the decision (remember again, those were the days, when TV would not relay the actual toss !) .. anyway tossing a coin is symbolic and – is hard to predict !! Today at Uppal, Hyderabad, Sun Risers skipper Kane Williamson won the toss – Ajinkya Rahane called incorrectly. In this edition of IPL, thus far, Teams have tended to bat first, and also because no 150-plus target has been chased down in the last three IPL seasons in Hyderabad. Sunrisers preferred an overseas fast bowler in Billy Stanlake in place of England batsman Alex Hales. As usual it is coin toss (actually it not as so usual with other Tests & ODIs – IPL is always different!) – when a coin is tossed up, it has come down and rest on one side – be it ‘Heads or Tails’ – the possible outcomes are 2 and the probability of a Head is ½ or 50%. It is the simple probability theory and this way of looking at probability is called the relative frequency estimate of a probability. If you are walk out as a Captain and call it – say Heads 10 times, it may not always be 5 wins – but perhaps, the more you flip the coin, the closer you get to 0.5. The Diaconis - Holmes - Montgomery paper Dynamical bias in the coin toss suggests that in coin-tossing there is a particular ``dynamical bias" that causes a coin to be slightly more likely to land the same way up as it started. Some are more successful than others ~ in way it is always the Visiting Captain, who wins or loses – for the Home team captain tosses the coin, while the Visiting Capt calls (recall Kumara Sangakkara claiming that he forgot to call in the finals of WC 2011 and there was a retoss !!). When England toured India in 1963, Mansur Ali Khan Pataudi won all the 5 tosses. Between 1959 to 1961 England (captained by PB May and MC Cowdrey) won 12 continuous tosses. India won their first ever badminton gold in the mixed team category at the Commonwealth Games, after securing a 3-1 victory over Malaysia in Gold Coast. Satwik Sairaj Rankireddy and Ashwini Ponnappa gave India a strong start, clinching the mixed-doubles rubber with a 21-14, 14-21, 21-15 win against Peng Soon Chan and Liu Ying Goh. Srikanth built on that strong start by defeating Lee Chong Wei in straight games, and though the men's doubles pair of Chirag Shetty and Ranki Reddy lost their match, Saina Nehwal ensured India would bring home their elusive gold medal after beating Soniia Cheah 21-11, 19-21, 21-9. The tone was set by Srikanth's 21-17, 21-14 win over Lee Chong Wei in 43 minutes. "Today was one of those days when everything went fantastic," Srikanth said after the win. 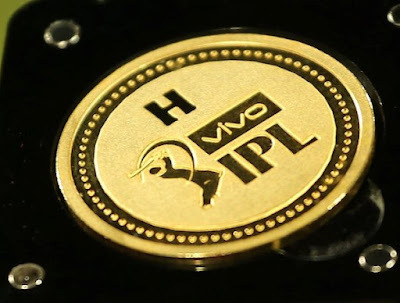 ~ to some, it could be news that it is a brand new gold coin specially minted, used for the toss in IPL. Black Caps captain Kane Williamson has reached out to disgraced Australian opener David Warner in the aftermath of the ball tampering scandal which has rocked the sport the past week. Willaimson standing in for David Warner made his Captain debut in IPL. In an International Match, the playing X1 gets decided more or less by the balance ~ say Openers, 4 batsmen, wicketkeeper and 4 bowlers (say 2 spinners and 2 pacers) ~ only a couple of places could get decided in the last minute – these are tough decisions, last minute decisions known only after the toss. In Cricket, there is the practice of handing over a slip containing the names of the players to the opposite Captain before the toss. For deciding the playing eleven and in deciding the team balance, the team selection committee would spend hours to debate on players; the Captain in most times would have his choice too. So after losing the toss, Ajinkya Rahana was asked his team composition – in IPL, it is but regular to name their foreign players (as there is a cap of 4) - it is Ben Stokes, Jos Buttler, D'Arcy Short, Ben Laughlin for Rajasthan Royals. When Danny Morrison asked fellow team-mate Williamson, he said – Rashid Khan, the tall Billy Stanlake, Myself and .. and .. and .. somebody – he sought the help of Rahane, who muttered Shakib Al Hasan. So much so – knowing the team. Not out of place to point out that yesterday KKR Dinesh Karthik too fumbled and said, am new to Captaincy and it is difficult remembering names ! ~ is that really tough ?? .. ..and there is the game of reality where thousands daily pick their teams and predict star performers in every match to win points and play a virtual game !! 9th Apr 2018 @ 21:00 hrs.